I have had so much fun playing along with the PTI girls these past couple of months. 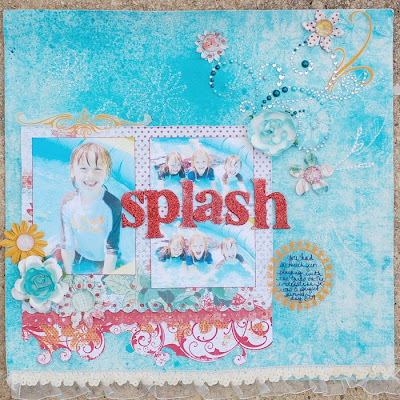 Today's project is my last post as Guest Designer. I'm so grateful to PTI for giving me the chance to work with them. It's been a wonderful experience. I'm really excited to be playing along with this challenge. We had to create a Christmas ornament. I decided to use a cookie cutter as my base. There are so many fun ones out there. 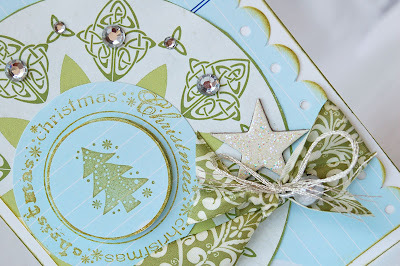 First, I stamped a medallion with Giga Guidelines using Spring Moss ink. 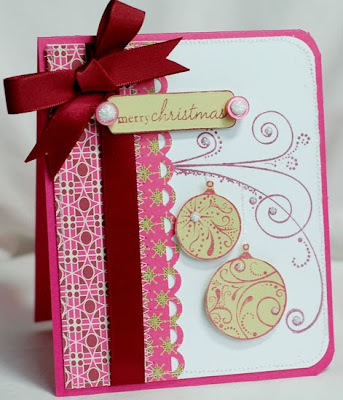 I stamped the dots from Communique Curves in Ripe Avocado and then stamped Merry twice in Rasberry Fizz. 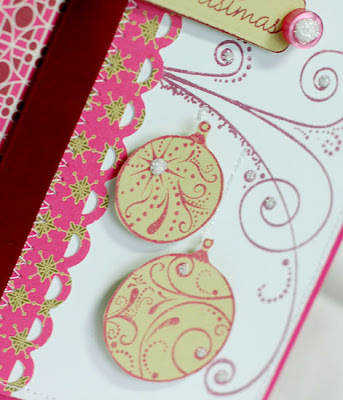 I add stickles to the dots. I attached this to the cutter. 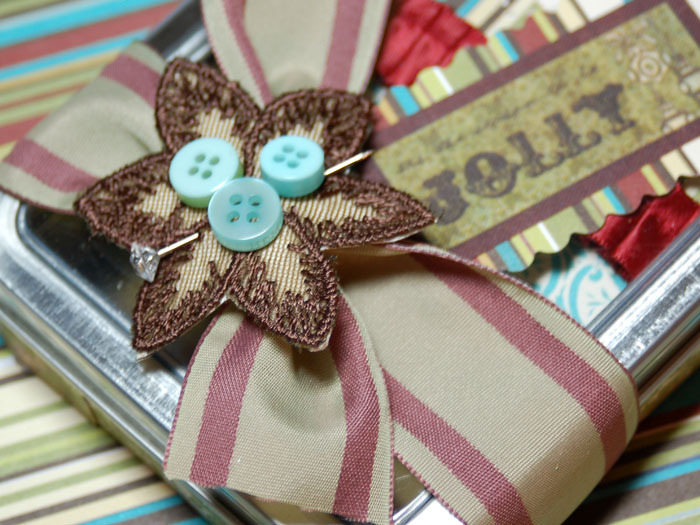 Then, I wrapped it in in Rasperry Fizz ribbon. 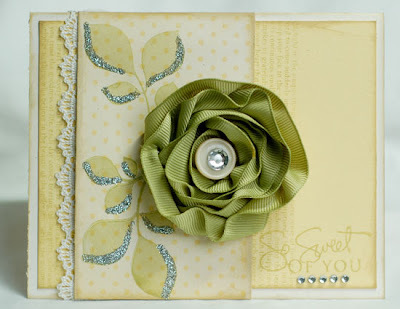 I stamped Background Basics Diamonds several times using Spring Moss. Then I cut 1/4 inch strips of the paper and adhered it over the ribbon using Scor - Tape. Finally, I added two buttons and lots of stickles. I made the matching little tag to go with it. Haven't decided who will get it yet, but I think I'll wrap it in clear cellophane and attach the tag at the top. I used the same stamp sets on the tag. 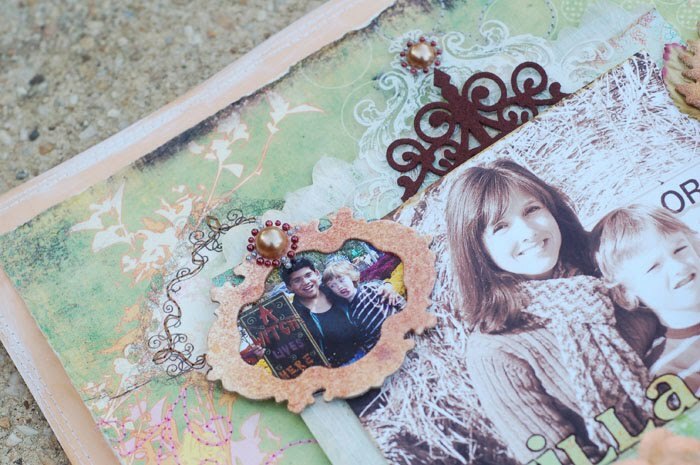 Be sure to check out the other ladies' blogs to see some really cute projects! So, have you started your shopping? This is the first time in a while that I didn't brave Target, Kohl's or Walmart at 5am. I usually go with my girlfriend, but she was in Georgia this year, so I stayed home. The fun for me is all about getting out of the house for some uninterrupted girl time, so going by myself wasn't an option. We did get the Christmas Tree up and I did some shopping online. Got some great deals, too! Speaking of shopping, recently, my brother found an old photo of our mall from around the time that we were kids. 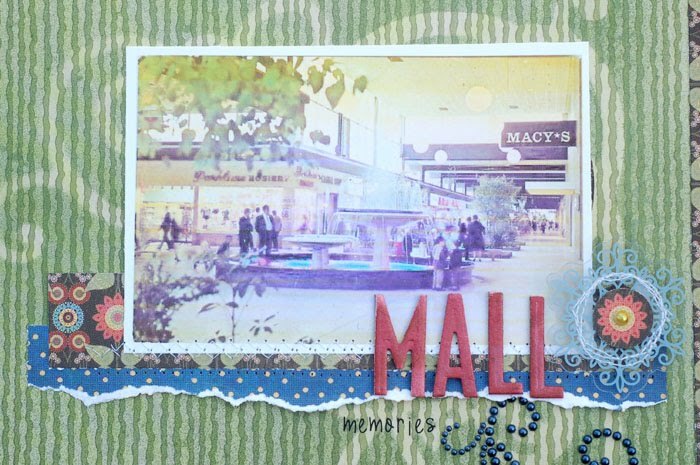 It's the Walt Whitman Mall on Long Island and the photo brough back such memories. I created this rather simple page. I wanted it to have a funky 60s/70s feel to it. 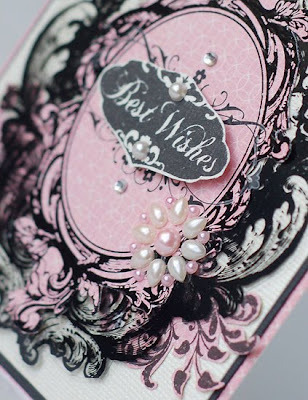 I used a Glimmer Screen and Glimmer mist for the background and added some Zva pearls. The snowflakes were turned into flowers. Here's the journaling if you're interested. When Al sent me this photo of the Walt Whitman Mall circa 1970, I was instantly transported back in time. How many times did I throw pennies into that fountain? looking for prom dresses. I love this photo for so many reasons. Mostly because it brings me back to the carefree, fun days of my youth. 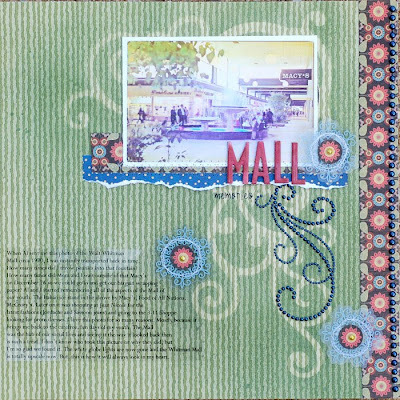 The Mall was the hub of our social lives and seeing it the way it looked back then is such a treat. I don’t know who took this picture or why they did, but I’m so glad we found it. The white globe lights are now gone and the Whitman Mall is totally upscale now. But, this is how it will always look in my heart. This photo made me want to go out and start taking pictures of everything around me. I'd love to see the grocery store we shopped at as kids, see the library how it looked and even view my old bedroom. I think having pictures of the 'mundane' things really captures history. Finding this photo is a reminder that I want to do that for Ryan. Happy Thanksgiving! We will be having a big family dinner later today, but I wanted to post this to wish all of my American friends a great Thanksgiving holiday. I truly am blessed in so many ways. I have the most loving and wonderful family, I have friends, near and far, who I cherish, and I have a hobby that I love! 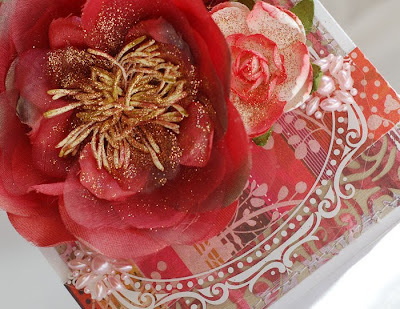 Thank you to those of you who stop by to read my musings and to see my latest creations. I appreciate all of your comments and good wishes and I feel so fortunate to have 'met' so many creative souls who share my passion. Here's a layout that sums up what I'm most thankful for. 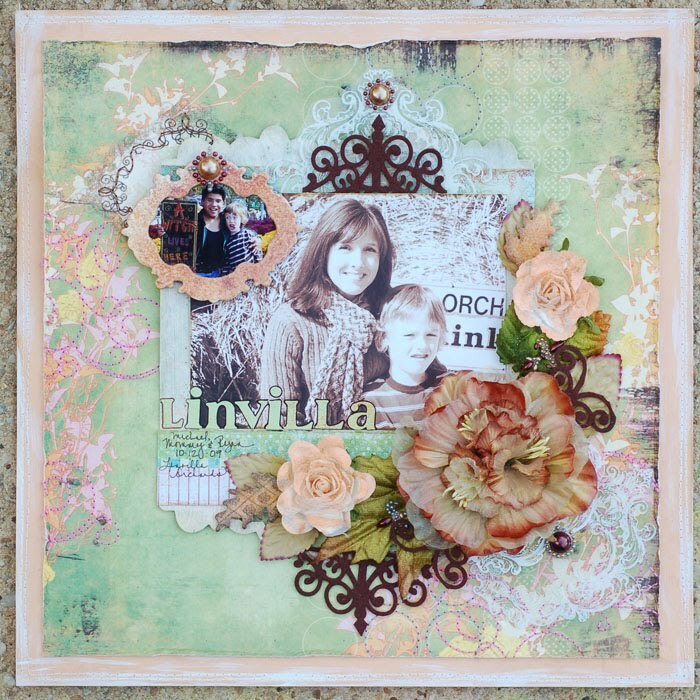 I used some Zva crystals and some Making Memories and October Afternoon papers. Thanks for stopping by and enjoy your turkey!! This weekend flew by way too fast! On Saturday, we tailgated at the Delaware/Villanova game with the family. We were the only UD fans in the group. And our team lost! But, it was still lots of fun! Then, yesterday, I met up with Cindy (of Emma's Paperie)and her friend Erin. We saw New Moon. LOVED it. Oh my gosh, I NEED a Team Jacob t-shirt. ;) :) :) I loved him after reading the book, and he stayed my favorite until the end of the series. Taylor Lautner totally does him justice on the screen. We hit PF Changs aferwards and feasted on all of my favorites. It was so good getting to see Cindy and being able to meet Erin. We're only a couple of hours aways from each other and decided we definitely need to do this kind of thing more often! So, here are two more of my Prima projects. I used the Tropics line on both of them. 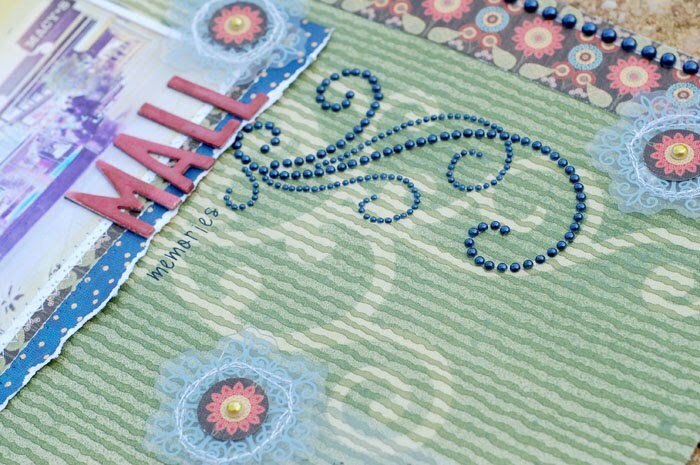 This layout has some Glimmer Mist spritzed onto the stitched paper. I wanted to make it look like water drops. I also wanted the pearl/crystal swirl to look like a splash. 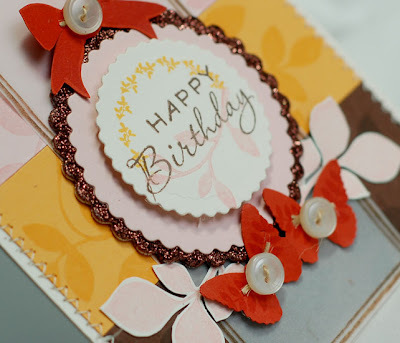 The card was really easy to make. 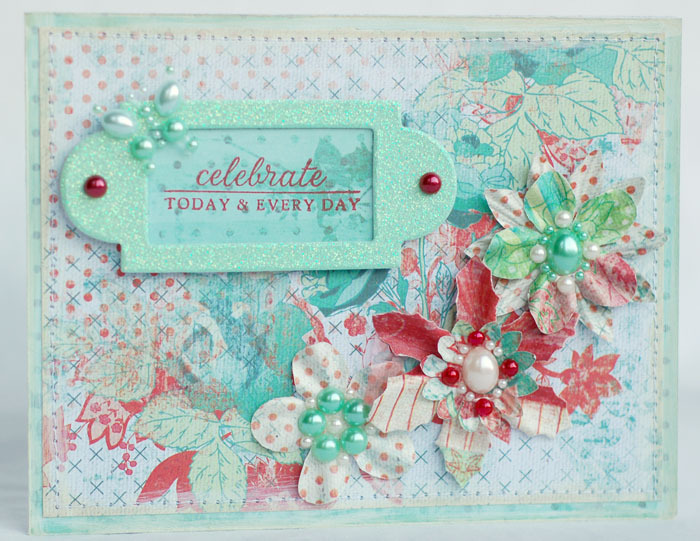 I used a floral piece of the Tropics paper and added flowers on top of it for lots of texture. The stamp is PTI. So excited to only work two days this week. Then, it's Thanksgiving!! 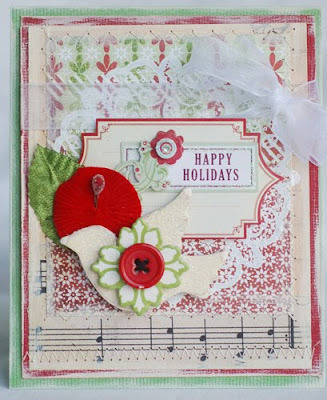 This first one uses stitched papers, flowers and some felt. I also added pearl centers. This next card is one of my new favorites! I used papers from the Indeed line, a flower and parts of a vine. I love the colors! The stamp is Papertrey. Just wanted to remind you, too, that the Webster's Crop is still going strong! Stop by Inspire Me if you haven't had the chance yet. If you haven't had a chance to get over to the crop at Inspire Me you need to! I have been having so much fun. The crop started last Thursday and will last until Sunday. Each day a design team member has been posting a project. There are lots of prizes, chats, but mostly inspiration! I am totally in awe of the projects people have been posting! They are amazing and it's worth heading over just to peruse the gallery. Here is the project I did last Friday. I made a card and tin set. 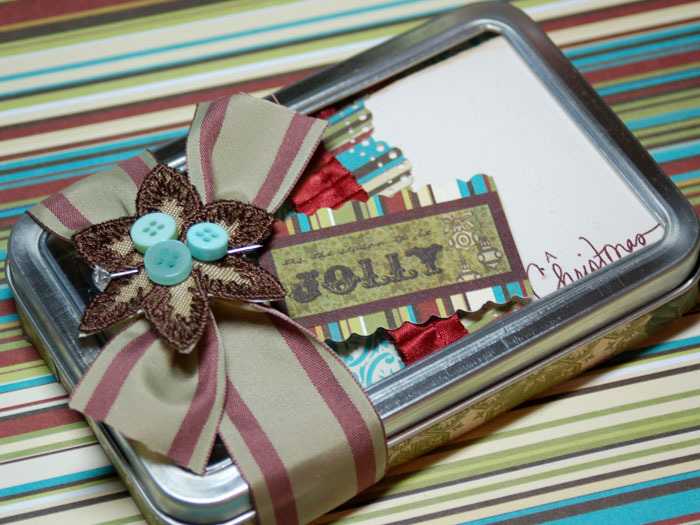 It's really quick and easy to make and would be a perfect neighbor, teacher or friend gift. Here is another project that I made. 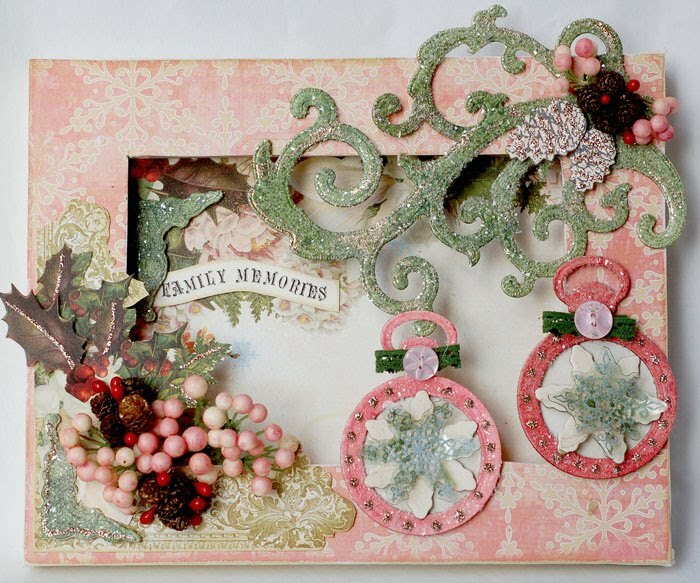 I based it on Lucy Edson's challenge to create a shadow box. One of the girls used the back of a canvas, so that's what I did, too. 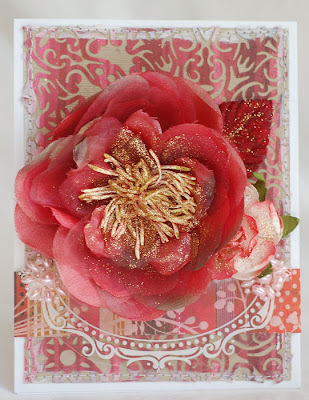 I used lots of paper from the Winter's Wings collection. I also used tons of Tattered Angels glimmer chips and glimmer mist. 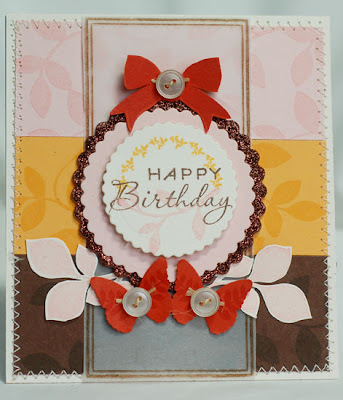 This first one is a card that uses Text Style 2 and Turning a New Leaf. I added some glitter to the leaves. 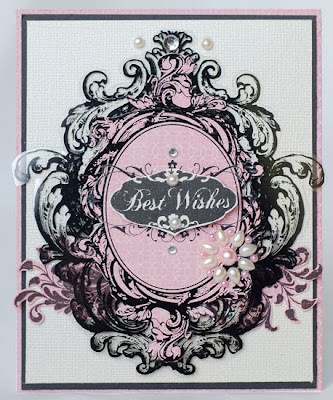 The sentiment is stamped with Signature Greetings. It's such a versatile set! 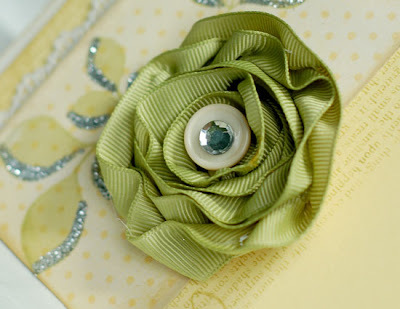 I created the flower on the front by scrunching up and layering some ribbon onto a piece of cardstock. This next card uses the new Background Basics: Diamond set. I used Communique Curves for the sentiment. 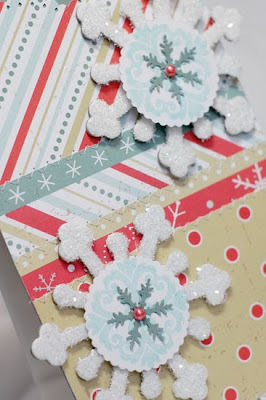 To make the snowflakes, I cut a piece of acetate from a box that the stamps come in, colored it with a Copic marker and punched out the snowflake. 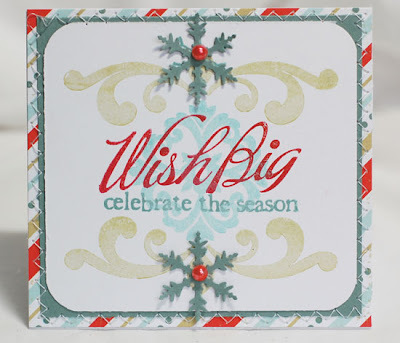 This last gift set uses Rustic Snowflake patterned papers, Giga Guidelines, Big and Bold Wishes and Holiday Tree stamp sets. 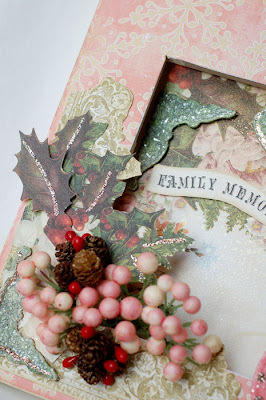 I have had sooo much fun creating with the gorgeous new November stamps!! Nichole and the gang have another brilliant release. 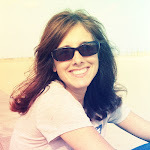 I'm so thrilled that I've gotten to be a part of the team agin this month. If you love sentiments as much as I do, you're going to flip over the new sets. This first card uses several of them. 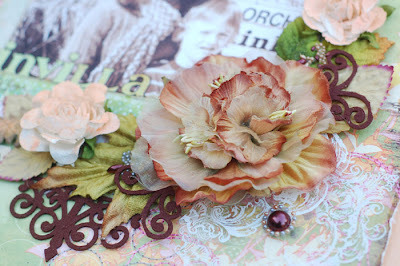 I stamped the leaves with Turning a New Leaf using Versamark. I also added splashes of the fun new color Terracotta Tile. 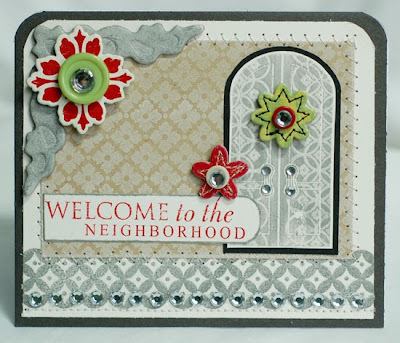 The sentiment is from Communique Curves and I added a leaf from Turning New Leaf as well. This next one is a fun one using Christmas Friends. I love the big swirl and decided to make it into a branch. 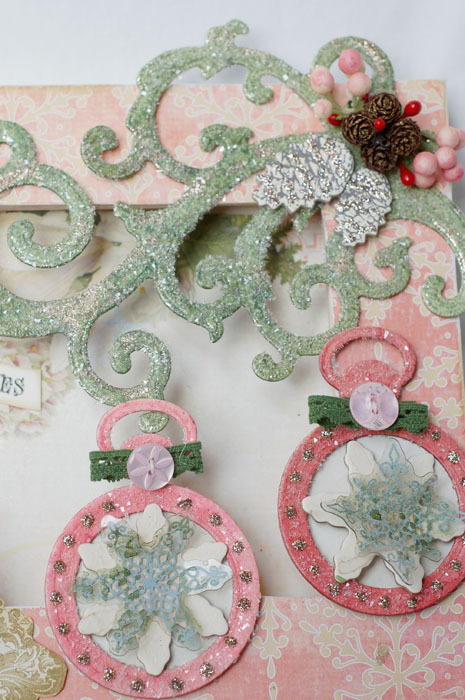 The ornaments are hanging by Stickles glitter threads. 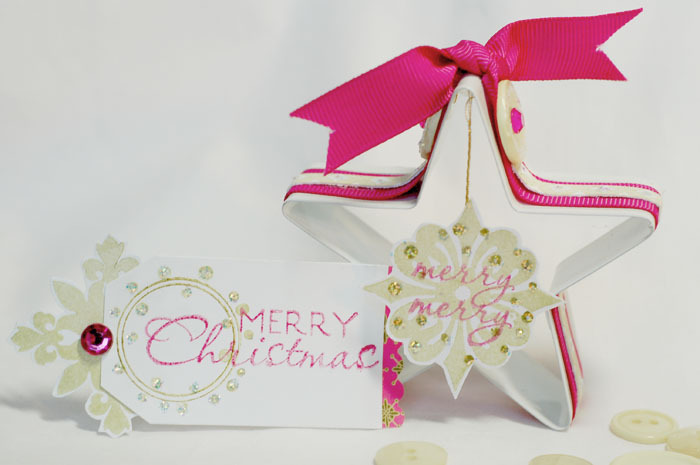 I added lots of glitter as accents, too. My third card uses the Home Made set. 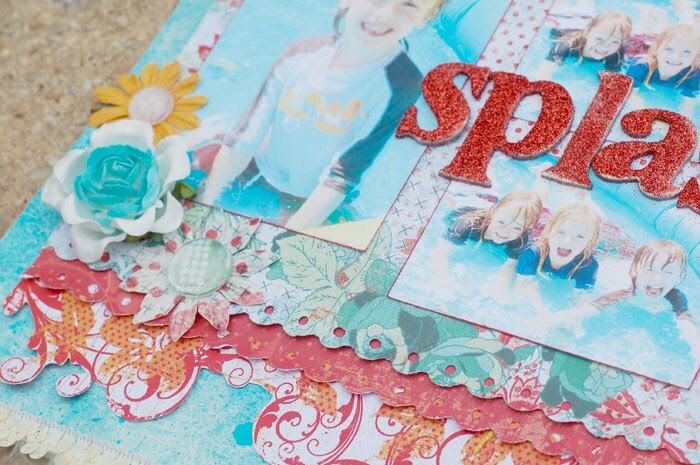 I LOVE this set and can't wait to get the new house template that Lauren is debuting this month. Have you seen the houses the design team made with it? They are absolutely ADORABLE!!!!! I also used the new Background Basics: Diamonds set on this one. 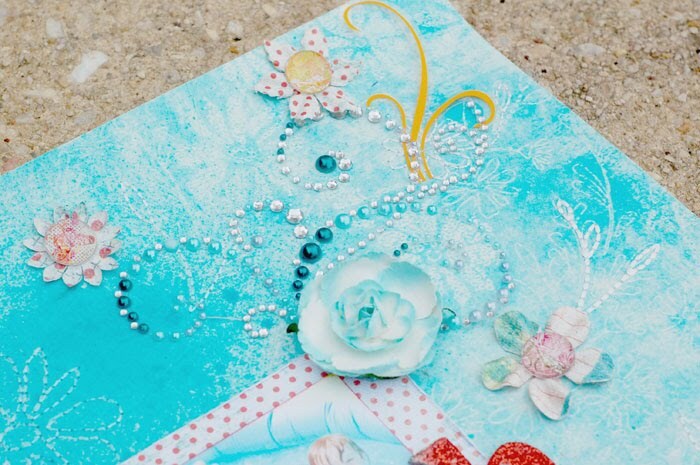 I used it to create the background paper and border. Additionally, I stamped the door and used the background stamp to 'kiss' the image, creating the pattern on the door. I'm so excited! 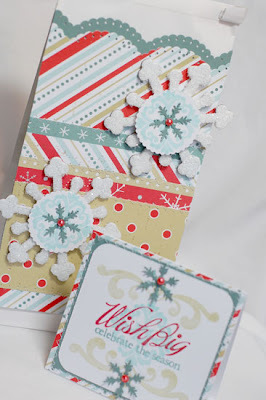 The 12 Days of Christmas Crop is starting today over at Inspire Me. Each day, one of the design team members will be posting directions for a project. The sneaks are amazing. 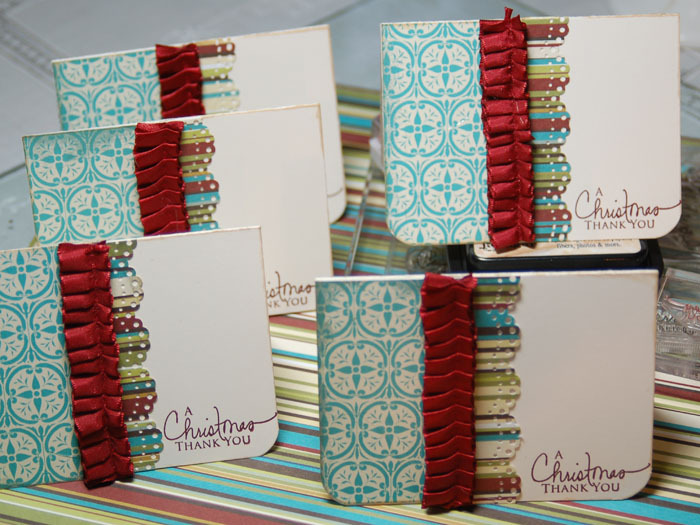 I will be sharing my project, a set of Christmas thank you notes, on Friday. And, I'll be hosting a chat on Friday night at 9 pm EST. I'd love for your to stop by! 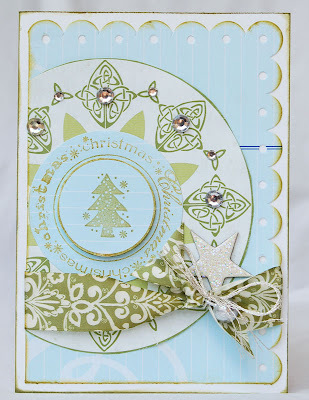 Well, my mojo returned thanks to some adorable new Cosmo Cricket Jolly By Golly papers that arrived earlier in the week. Can't wait to share what I made! 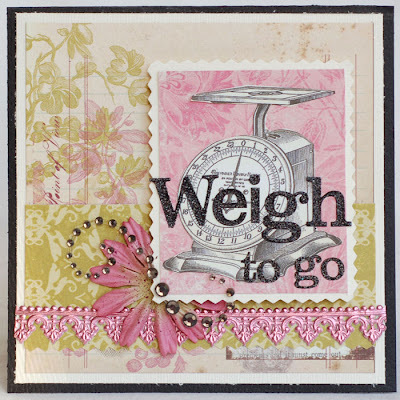 For now, here's my Emma's card for the week. 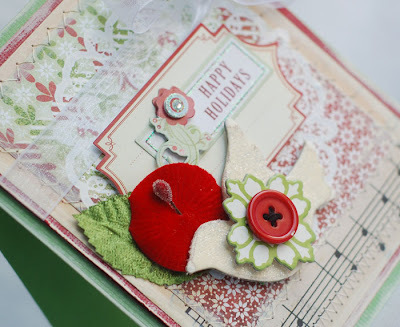 Our color inspiration was red and green. I used lots of Basic Grey, Making Memories and Hambly on here. Time to get back to my scraproom! 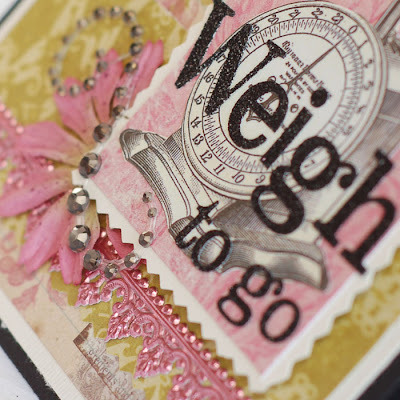 I've been busy working on my Papertrey Ink projects. I'll be posting them tomorrow night. 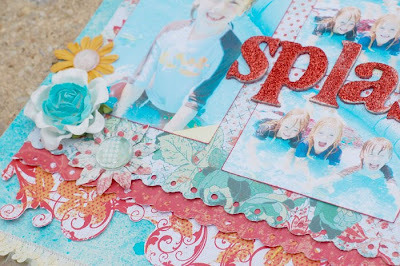 Have you seen the sneaks on Nichole's blog?? So many awesome sets this month. 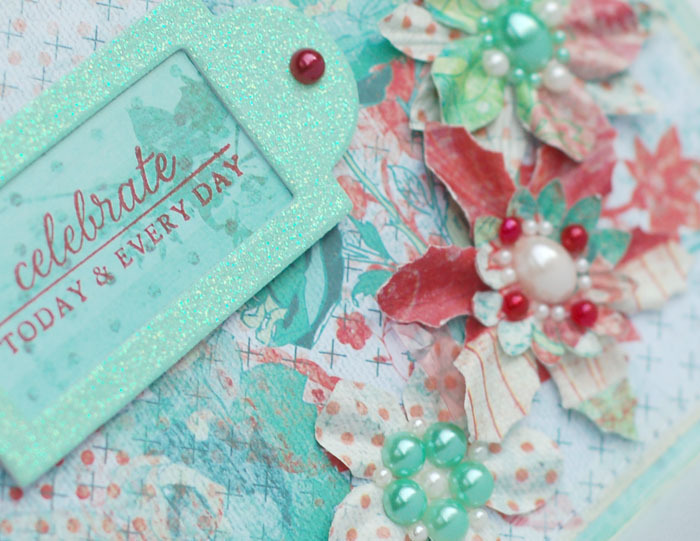 If you love sentiments, you're going to be so excited! It's lost! If you've found it could you please return it as soon as possible? I'm trying to get a bunch of things done and I need it back!! I was on a roll for the past couple of weeks and it seems like I just hit a wall! Ugh! I hate when this happens. 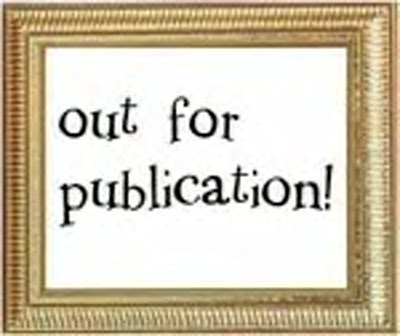 So, I'm going to sit down with my favorite magazines and just read. That usually gets me motiviated. I don't have anything new I can share right now. But, here's a peek at something I did that can't wait to share. It involves a fun toot that I can tell you about soon. I found a couple of cards that I haven't posted before. 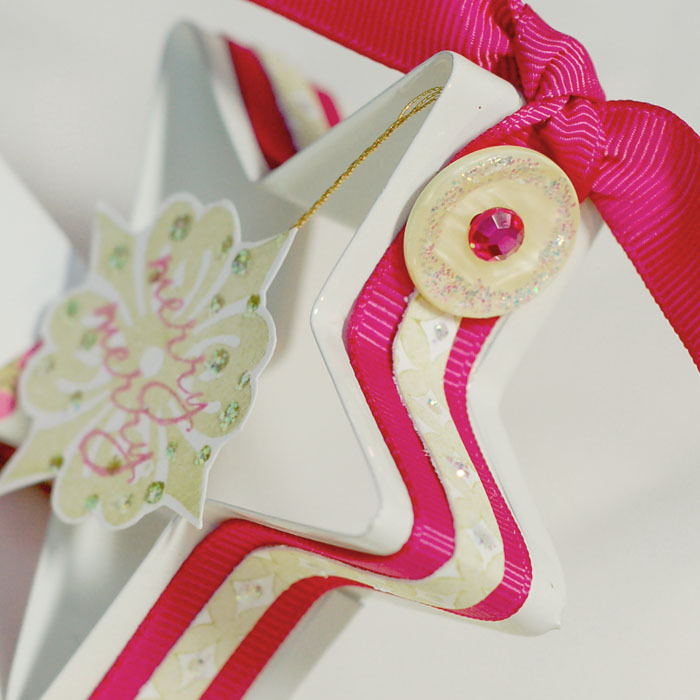 This first one was in Paper Crafts September/October issue. The paper and image are all Webster's stuff. Kind of a fun play on words. I have such a soft spot for flourishes and flowers. It seems like I just can't make something without using one of these two things. The two cards that I have to share today are so me. 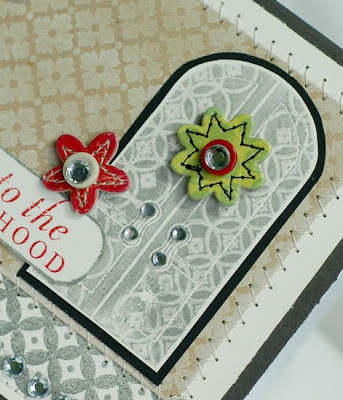 Yep, lots of flourishes and flowers. Lately, I just can't get enough of these big Prima flowers. I love the color on this one. 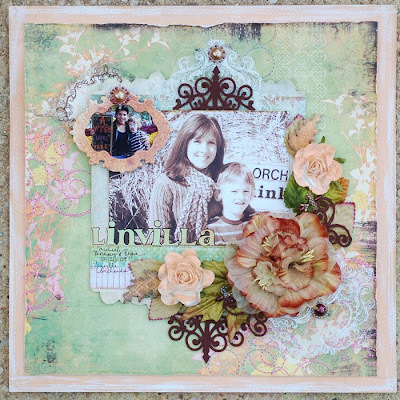 I paired it with some Basic Grey Indian Summer papers and a smaller trellis rose. 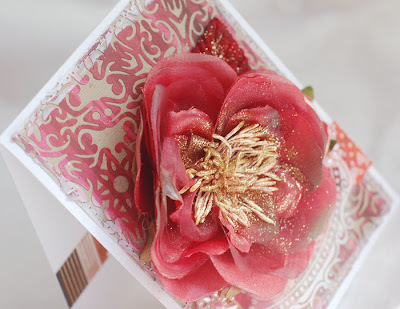 I added glitter to them by spraying a bit of spray adhesive and drizzling on the glitter. I used another Hambly frame and more Prima pearls. The sentiment was stamped on the inside. My little guy is still making up work from all of the school he missed last week. Did I tell you he had Swine Flu? Luckily, that's behind us and, knock on wood, we didn't catch it from him... Anyway, gotta' go and help him finish a couple of things.